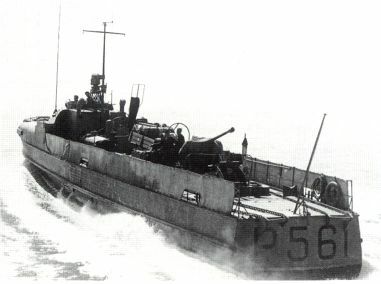 the end of the 1950's, in front is the torpedo boat VIBEN. 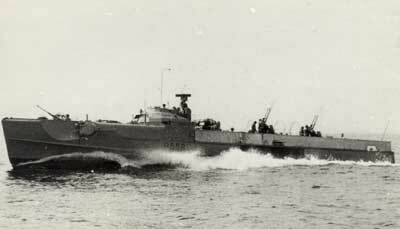 Built as German "Schnellboote" (British designation=E-boats). Most boats were aquired from the US authorities in Germany after the end of WW2, and six boats were aquired from Norway in 1951. The boats had different engine sizes, which would influence the top speed, range and displacement. 3 ea Mercedes-Benz Diesel engines 6,000-7,500 Hps. 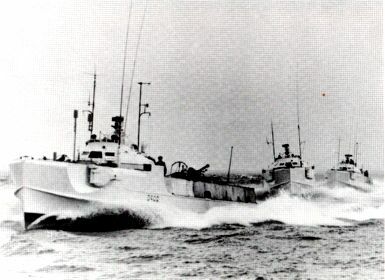 Four of the boats were painted in various colors in 1951; GLENTEN - navy grey, HÆRFUGLEN - white, SKADEN - sea green and TAARNFALKEN - light blue. This test should conclude which color was most suited for the future use on torpedo boats. 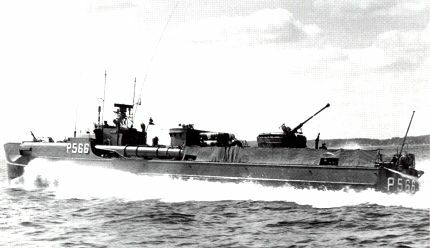 In May 1955 it was descided that torpedo boats should be painted white, this standard color scheme was altered to olive greeen in 1961.
on the port side, this was part of testings for the new torpedo boats of the FALKEN Class.